Like the Tokyo Raid of 1942 (aka the Doolittle Raid), this attack, Operation Meetinghouse, was meant to damage Japanese morale and spur the end of the war. Nearly 300 U.S. planes dropped 1,665 tons of incendiary bombs on Japan’s capital, igniting a firestorm that destroyed much of the city’s industry and killed 90,000 to 100,000 people. The nighttime raid marked a turning point in U.S. bombing tactics in the Pacific Theater. Who was responsible for planning and executing the firebombing of Tokyo? General Curtis Lemay, the new commander of the XXI Bomber Command in the Pacific, was charged with planning the raid. 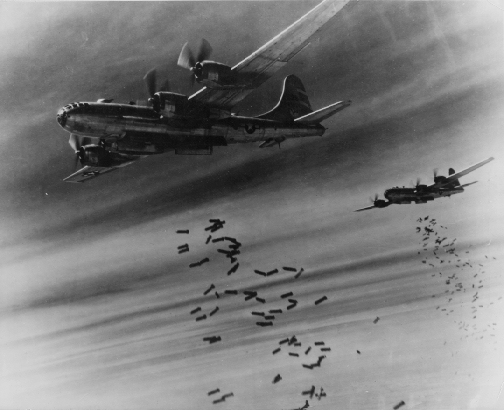 In addition to decimating the industrial targets, railroads, and other key infrastructure in Japan, Lemay sought to resuscitate the strategic bombing campaign in the Pacific and prove the value of the B-29 Superfortress bombers by changing the tactics of air attack operations on Japan. While scholars credit the brilliant and ruthless General Lemay’s ideas with helping to defeat Japan, U.S. Army Colonel Henry A. Byroade’s oral history indicates that logistical problems nearly thwarted Lemay’s campaign before it could begin. The general’s solution was brutally effective. In the raids that followed, bombers left the runways one at a time with a minute between them. While the plan made each plane more vulnerable to air defenses, it minimized the logistical quandaries and made the bombing campaign possible. 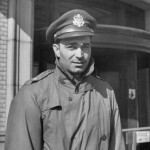 Operations like the March 9-10 raid on Tokyo “gave a psychological boost for our troops everywhere around the world,” Byroade recalled, and probably hastened the Allied victory. After the war, Curtis Lemay remained a pioneer of air power, leading the Berlin Airlift and directing the Strategic Air Command. Henry Byroade became a military attaché to General George C. Marshall on his China mission before embarking on a long and distinguished career as a diplomat. Check out the Truman Library’s fascinating oral history interview with General Byroade to learn more about his experience building of airfields in the China-Burma-India theater during World War II, the Berlin airlift, postwar occupation of Austria and Germany, U.S. policy toward the Middle East, the Suez crisis and more! 70 years ago, World War II ended under President Truman’s decisive leadership. Now, follow key events from the war’s final months with the Truman Library Institute’s series, “Marching to Victory: WWII Highlights from the Truman Library’s Archives and Collections.” The 25-part blog series opens the vaults at Truman’s presidential library to share eyewitness accounts and historic artifacts related to major conflicts and monumental victories – from the Battle of the Bulge to the liberation of Dachau to the unconditional surrender of Japan. Contributed by Will Hickox. Will is a Ph.D. candidate in history at the University of Kansas in Lawrence, Kansas. He has written for The New York Times and contributed to several digital history projects.